I am exercising my Rights under the Conventions Given to Persons Working From Home: I am wearing sweatpants. Don’t worry my dear, posh Vancouverites, they’re Lululemon! I have completed my red carpet-worthy outfit with an old flannel shirt. Though I’ve considered it often, this is the first time I’ve donned the comfy clothes since I began my work-from-home adventure back in April. I had jeans on earlier today. Baby steps. I took my inspiration from the slug pictured above – our dog Emily. She’s very knowledgeable about the ways of being comfortable during working hours. 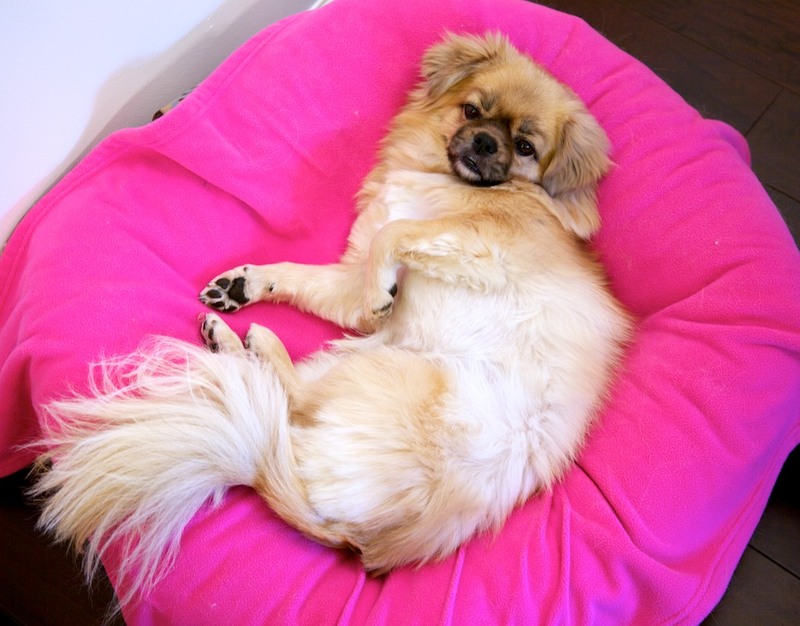 This, for example, is her enjoying a pink fleece blanket on top of her fancy pillow. Note her general dissatisfaction that I’ve disturbed her. I read some other peoples’ blogs recently (gasp! I know!) and I realized something. Reading posts that complain and apologize for a lack of posting is horribly boring and pitiful. Therefore I apologize for apologizing. And I will never do it again! Moving on then……….. This needs a Like button – I would click it. I have no idea how to do that. I’ll see if I can find out! Hey cdub, this post explains it fairly well: http://mashable.com/2010/05/07/wordpress-facebook-like-buttons/ The easiest way is a plugin. The other way is by placing an iFrame in your wordpres code, which is what I use, but you have to be omfortable editing your wordpress code if you do it that way. Got it! Didn’t need to add a plug-in or code Moj. Besides, I only have WordPress.com – not .org. Therefore I can’t add plug-ins as far as I know. And my efforts with code are pathetic. For all future seekers of this information, go to Dashboard, Settings, Sharing… From there you can enable buttons now seen here. You can further manage what the buttons do, whether it’s Like or Share (Facebook), etc. Had to do a bit of digging, but found it after all. Thanks everyone.